Look. I didn’t want to start my holiday celebrations with this movie either. But friendship is a democracy and I was outvoted in the movie pick that night. I mean, I knew this movie was going to be bad. I kept shouting, “I brought games! Let’s play a game! Anything but that movie! PLEASE!” but my voice was drowned out under the excited baying of cattle unaware of the slaughter before them. I guess the cattle are my friends in this metaphor. 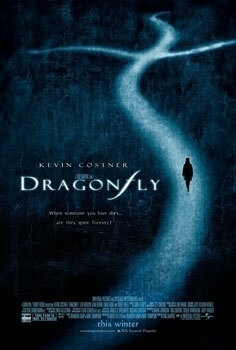 Dragonfly is a movie of sorts that came out in 2002. It’s one of those films that I remember seeing commercials for and thinking, in my sixteen year old wisdom, that it looked bad and was not worth seeing. Not even as a casual viewing. There’s so much good cinema out there that I haven’t seen, why waste any time on a Kevin Costner dud? And so I was successful for thirteen years, until a few weeks ago. Kevin Costner’s wife has died (maybe) and now she might be haunting him (maybe). Of fun note is that his wife is played by Susanna Thompson, mother of Oliver Queen and failer of cities. That’s about where the interesting notes end. Do you like jump scares? This one tries and fails at a few. Do you like creepy kids with weird psychic powers? This movie hopes so but then drops the ball by having the kid not be creepy or psychic. In the end, Costner isn’t being haunted, he’s being texted by his wife because she may have left something for him in the jungle. The movie stops being creepy after the opening shot but things really lose all sense of purpose when Costner gets on a plane. The whole third act is in a jungle with him looking for a bus and his wife (maybe). Seriously, I can’t describe this movie, it makes me go into a comatose state. This is the type of direct-to-dvd trash that my friends of my teenage years made me watch and that gave me such a bad taste for bad movies. The kind that even a Rifftrax can’t fix. I know people who can watch a bad movie if it’s at least entertaining, or the prestigious so-bad-it’s-good. But I can’t. Films like Dragonfly waste everyone’s time. It has nothing to say, it poorly says that nothing, and in the end, you’ve wasted a hundred minutes watching Kevin Costner talk to a bird. For different opinions, all my friends are blogging our holiday celebrations! Posted on October 13, 2015, in halloween and tagged bad movie, dragonfly, halloween, kevin costner, october. Bookmark the permalink. 3 Comments.